This week, we have a change of pace on Dispatches from the Field! We are very excited to welcome archaeologist Marianna Cervantes, who tells us a bit about her experience doing archaeological field work in British Columbia. For more about Marianna, check out her bio at the end of the post. For many, the field of archaeology is tied to the image of Indiana Jones defeating Nazis with whip in hand. Others associate archaeology with trowels, brushes, and meticulous desert excavations done by guys in pith helmets. Cultural Resource Management archaeology, or CRM, is neither…but maybe a bit of both. (No dinosaurs, though!) Dubbed “hit and run” archaeology by one of my undergrad profs, it is rapid assessment and testing of sites ahead of development to ensure nothing of archaeological importance is disturbed or destroyed. Clearing snow from a test location in the winter before the saw gets started. 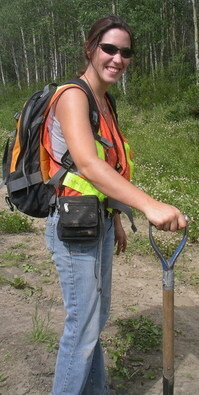 In spring 2006, I went out in the field in the wilderness of northeastern British Columbia with an experienced archaeologist. As we drove down the dirt oilfield road, she called our position on the radio for other road users, a common practice on logging and oilfield roads, while I tried to figure out the maps in the passenger seat. In the back, and in the two trucks following us, were First Nations participants. We asked First Nations bands whose traditional lands we were assessing to send members with us, to provide input, represent their bands, and help us find areas that should be reported as important. That day, because of the geographic location we were assessing, there were representatives from eight bands – considerably more than usual. Indigenous representation and investment in the land is something important to consider for anyone working in nature. We started down the final road to the site and found gigantic dump trucks, in the midst of building a wellsite, at the end. The dirt road had become mud, covered with ruts easily a foot deep caused by all of the traffic to the active construction site. To get down the road, our trucks had to be expertly balanced on the higher areas. When we made it to the end, we parked our trucks in a convenient spot, and struck off into the woods to have a look at the land. 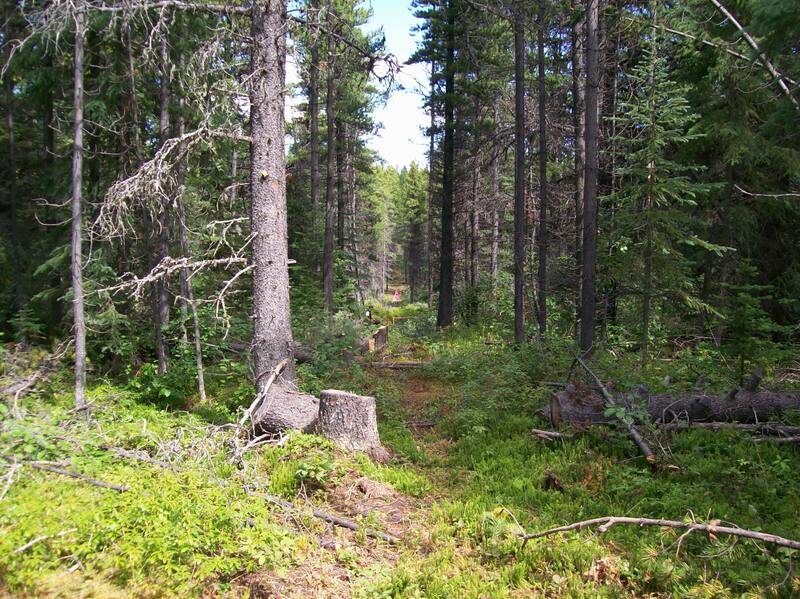 We had a large area to cover, with several kilometres to walk, and a lot of gear to carry. I was pretty overwhelmed by the logistics so far, and my boots weren’t even broken in yet. This was neither classroom nor field school, where I had learned about slow, controlled excavations rather than fast and decisive tests of areas that have archaeological potential, or simply ‘potential’. View down a cut-line, with a knoll in the distance. An area of potential to look at! While some scientists look at habitats, vegetation, water, or wildlife, the archaeologist looks at both nature and the land, trying to determine how it was used in the past and digging where there may be evidence of that. Those areas are areas of ‘potential’. 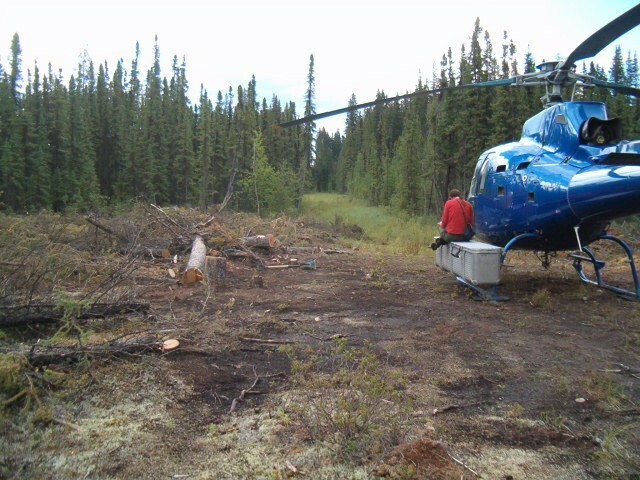 In the context of northeastern BC, we were looking for artifacts left by the past inhabitants, ancestors of some of the participants who accompanied us. Identifying potential is complicated though, because the use of land in the past is often different than what we would expect, given its present-day form. A dip in the landscape may be all that remains of an old oxbow lake, where someone may have camped because of access to water and fishing, whereas a south facing barren rise may have been a treed elevation over swampy ground, catching sunshine on short winter days. After some interpretation, as well as input from the participants (if they are present), dig locations are decided upon. That first day, I recall digging tests. 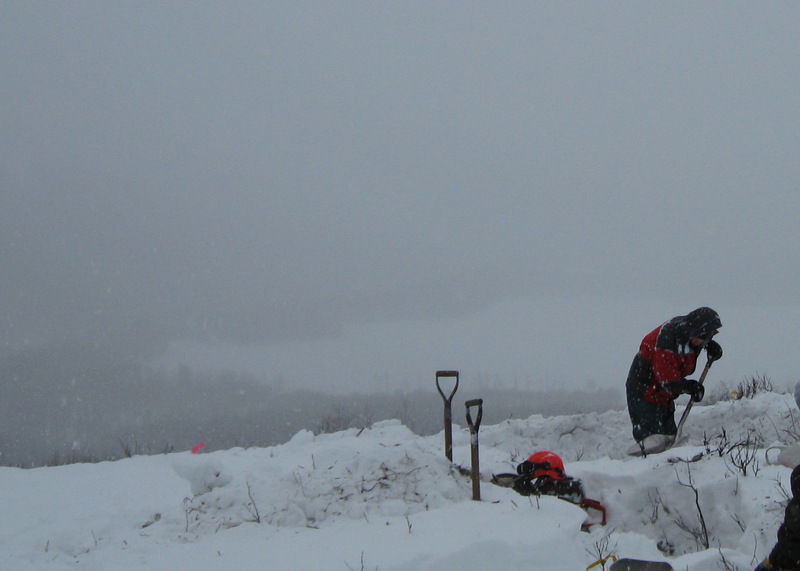 Tests are about 30x30cm, reaching down to glacial soils, and are dug on areas of potential. They act as a representative sample of the topographic feature and hopefully show whether there are artifacts present. Artifacts indicate previous habitation or use, which can require a change in the client’s development plans. (For example, on that first day, we were scoping out a location where an oil and gas company were planning to build a wellsite). A projectile point found in a test. Artifacts are sometimes obvious, like ‘arrowheads’, scrapers, and other tools; at other times, they can be less obvious. For example, stone tools are shaped using other stones, and their construction may leave behind identifiable (and important) flakes. Sometimes the source of the stones used for tools can even be traced. In the environment we were working in, organic artifacts don’t tend to be preserved well due to soil conditions, so stone flakes and tools are often all that remain. Disappointingly, despite doing several tests on potential areas, we did not find anything that first day in the field… which is often the case when doing archaeological assessments. We ate our lunch sitting on the ground under the trees, a lunch environment I would eventually take for granted. I remember one of the First Nations Participants chatted cheerfully with me, knowing I was new. He explained to me how to tell the direction from the sun (a skill I used often during the rest of my time in the field), and told me that the direction of the shadow can help you tell time. Then he leaned in, and with the serious air of someone imparting deep, secret knowledge, told me that at night time I could use a flashlight. I wasn’t sure how to respond to that. We ended up having a good laugh at my bafflement while walking back to the truck. While we were packing our gear back into the trucks, a big pickup with gigantic tires roared onto site. A man jumped down from the cab and came over. “What are you guys planning to do?” he asked. 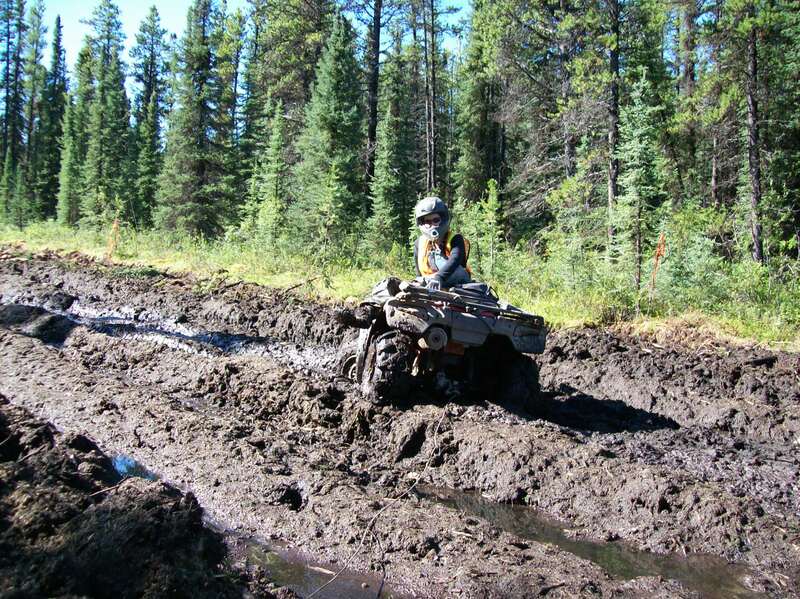 Driving an ATV to get to a project area, #DressedLikeAWoman. “Oh….huh.” At a loss for words, the guy walked away muttering. My co worker drove again, leading back out with the same easy skill she exhibited on the way in. That first day showed me that if this was just the start, I was going to like this much more than the waitressing I’d done to supplement my university loans. Taking some notes before hopping back in the helicopter. A different office every day. That was one day, and one assessment. Over the next few years, I became a field director and a permit holder, and I was involved in hundreds of site assessments, working in the field almost daily, driving many of the same roads I’d driven that first day. I identified many archaeological sites and had so many incredible moments. Eventually, I made the difficult decision to leave fieldwork, but I sorely miss it…although it is nice to work indoors in the winter and have regular hours. However, the lure of fieldwork will always be there. The way I see the environment and my world in general has been changed by the time I spent seeing the land and nature in a different way. Marianna Cervantes started working in archaeology after completing a BA in Anthropology, and left archaeological fieldwork in 2010, to spend more time with family and have a chance to recuperate. She recently finished her dissertation in forensic anthropology as part of a part time MSc in Forensic Science, while also working full time assisting at autopsies. She is currently getting ready to start working on PhD applications and is looking forward to having some form of fieldwork in her future. She can be found on Twitter at @BoneArky.